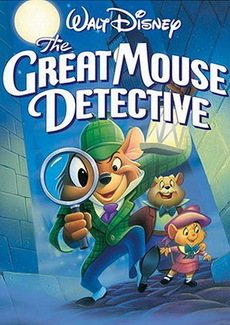 Basil, the rodent Sherlock Holmes, investigates the kidnapping of a toy-maker and uncovers its link to his arch-enemy, Professor Ratigan. In Victorian London, England, a little mouse girl's toymaker father is abducted by a peglegged bat. She enlists the aid of Basil of Baker Street, the rodent world's answer to Sherlock Holmes. The case expands as Basil uncovers the crime's link to a plot against the Crown itself. A lost and alone kitten joins a gang of dogs engaged in petty larceny in New York. Inspired by Charles Dickens' "Oliver Twist". A homeless kitten named Oliver, roams the streets of New York, where he is taken in by a gang of homeless mutts who survive by stealing from others. 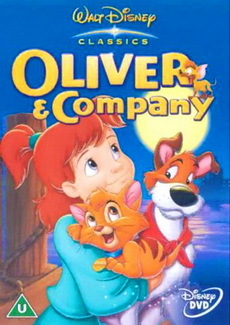 During one of these criminal acts, Oliver meets a wealthy young girl named Jenny Foxworth. This meeting will forever change his life. 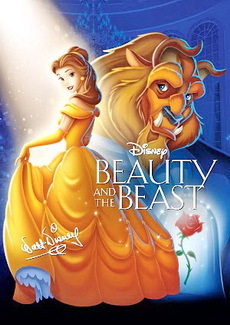 A young woman whose father has been imprisoned by a terrifying beast offers herself in his place, unaware that her captor is actually a prince, physically altered by a magic spell. Having lived a life in selfishness, a young prince is cursed by a mysterious enchantress to having the appearance of a monstrous beast. His only hope is to learn to love a young woman and earn her love in return in order to redeem himself. Years later, his chance shows itself when a young maiden named Belle offers to take her ill father's place as his prisoner. With help from the castle's enchanted staff, Belle learns to appreciate her captor and immediately falls in love with him. Back in the village however, an unscrupulous hunter has his own plans for Belle. 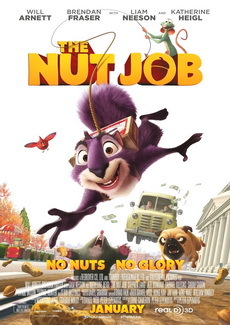 An incorrigibly self-serving exiled squirrel finds himself helping his former park brethren raid a nut store to survive, that is also the front for a human gang's bank robbery. In a city park, Surly the Squirrel has finally gone too far with his latest caper leading to the animal community's winter food cache being destroyed. Now exiled, Surly and his rat buddy Buddy's collective nightmare on the streets ends when they discover a nut store to raid. Meanwhile, the squirrels, the heroic Andie and the ditsy Grayson, are charged by Raccoon to find a new food source and Andie runs into Surly. With no other options, she arranges a deal to help in Surly's heist for the colony, even while Surly fully intends to betray it. However, there is more going on with the nut store being a front for bank robbers while Raccoon has his own agenda to ensure his own power. In the mayhem to come, Surly finds himself challenged in ways he never expected and discovering the real prize to treasure in this adventure. 14 years have passed since the near third impact. Most of the world has changed except Shinji Ikari who awakens, unaged in a new and strange environment. Misato has formed a group that has is separate from Nerv. The fight is far from over but the biggest struggle might be against humans and former allies. 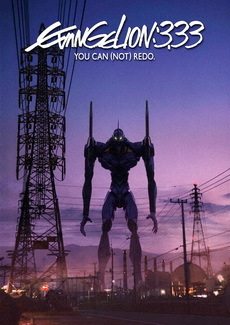 Evangelion: 3.0 You Can (Not) Redo. 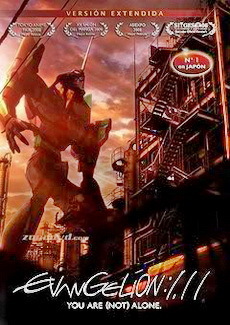 (ヱヴァンゲリヲン新劇場版：Q Evangerion Shin Gekijōban: Kyū, "Evangelion: The New Movie: Q", where the "Q" stands for "Quickening") is a 2012 Japanese animated science fiction film written and directed by Hideaki Anno and the third of four films released in the Rebuild of Evangelion tetralogy, based on the original anime series Neon Genesis Evangelion. 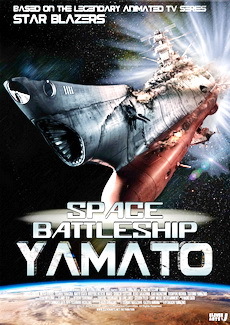 It was produced and co-distributed by Anno's Studio Khara and released in Japanese theaters on November 17, 2012. Under constant attack by Angels, NERV introduces two new pilots: the mysterious Makinami Mari Illustrous and the intense Asuka Langley Shikinami. Parallel to the incursion, Gendo Ikari and SEELE proceed the secret project that involves both Rei and Shinji. 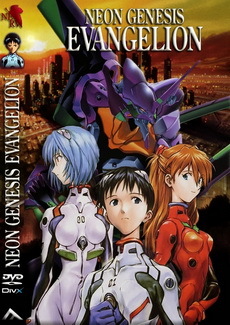 The film continues the story of Evangelion: 1.0 You Are (Not) Alone, with Shinji Ikari continuing his role as a pilot of one of the gigantic "Evangelion" mecha as part of NERV's ongoing fight against the mysterious creatures known as Angels. While replicating many scenes and plot elements from the original series, the film also introduces new ones, including newly designed creatures and new characters, such as Mari Illustrious Makinami, and integrates newly available 3D CG technology. Its ending paves the way for the significant storyline departures from the original series in Evangelion: 3.0 You Can (Not) Redo. The fate of the world is threatened by seemingly monstrous entities known as Angels. NERV is an organisation set up to counter this threat and it is up to young pilots to protect Earth but exactly what are the real motives behind NERV? 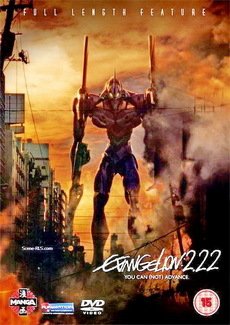 The film focuses on a young teenager named Shinji Ikari, who is asked to pilot a mecha known as "Evangelion Unit-01" to protect the world from mysterious creatures known as Angels. The plot is largely a point-for-point adaptation of the first six episodes of the original anime. While some scenes and events are replications of the original series, others unfold differently with new or omitted scenes and newly-available 3D CG technology. 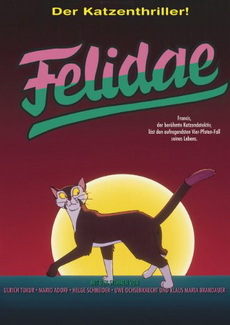 The film received a positive response from fans, with Hideaki Anno himself calling it a "faithful remake of the original series". The film was ranked as the 4th-highest grossing anime film at the Japanese box office during 2007, earning a total of 2 billion yen. 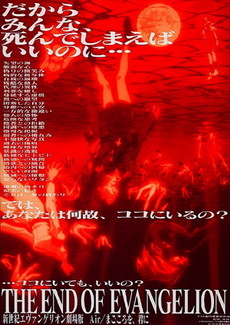 Concurrent theatrical ending of the TV series "Shin Seiki Evangelion" (1995). After the defeat of the final Angel, Shinji Ikari falls into a deep depression. When SEELE orders the JSSDF to make a surprise attack on NERV's headquarters, Gendo Ikari retreats down into Terminal Dogma along with Rei Ayanami, where he begins to advance his own plans for the Human Instrumentality Project. Eventually, Shinji is pushed to the limits of his sanity as he is forced to decide the fate of humanity. A teenage boy finds himself recruited as a member of an elite team of pilots by his father. When the Angels start attacking the planet Earth in the year 2015, only a handful of 14-year-old EVA pilots are able to stop them. Young Shinji Ikari suddenly finds himself forced to pilot EVA-01, a giant organic mecha, designed and constructed by NERV, that is the only thing that can stop the Angels.